EUROTEK.2010 - the bi-annual Advanced and Technical Diving Conference - was held on Saturday 16th and Sunday 17th October 2010 at the International Convention Centre, Birmingham, England. 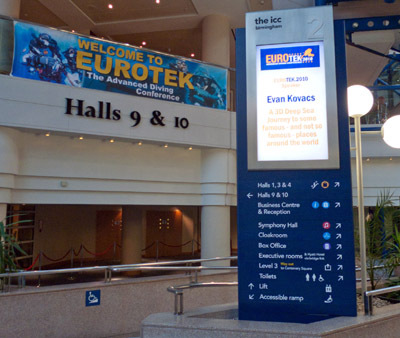 This year saw 500 delegates travel from 18 different countries to attend EUROTEK.2010. Over the two days 35 leading diving experts delivered 45 different Seminars, Workshops and Presentations covering recent expeditions, wrecks and diving in mines and caves. Technical topics included in-water recompression, CO2 issues, modern decompression advancements and accident analysis. In addition Rich Stevenson chaired a Rebreather Panel where delegates were able to discuss and get their questions constructively answered by leading manufacturers in a candid open forum. 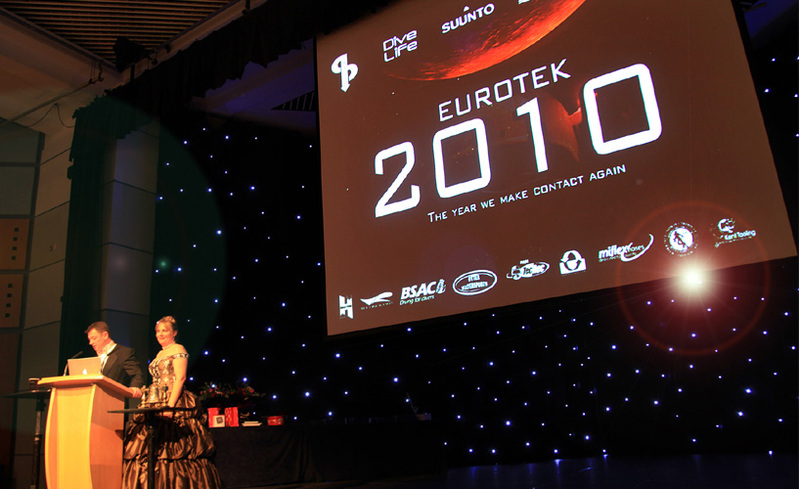 EUROTEK.2010 was kicked off by Leigh Bishop who delivered a poignant and brutally honest presentation about the events that led up to the death of EUROTEK Co-founder Carl Spencer. Carl lost his life in May 2009 whilst filming a National Geographic programme on HMHS Britannic. Illustrated by stills and footage of the incident Bishop explained what went wrong and the hard lessons that were learnt from this tragic accident. The emphasis of this presentation was to hammer home the harsh lessons learnt and to hopefully save lives thus preventing this incident occurring again. American Evan Kovacs had travelled to Eurotek and made history by projecting on a huge screen some of his recent underwater work in 3D. Having never been attempted at a dive show of this kind before, delegates enjoyed some stunning 3D material including images of Titanic shot only two weeks before the conference. Co2 monitoring issues were a key topic of the Conference and Austrian speaker Arne Sieber showed delegates a glimpse of the future with some very interesting developments in cell technology. Briefly Sieber has built a tiny CO2 monitoring system with two monitors (encapsulated in ceramic) approximately the same size as a rubber on the end of a pencil. These are neatly fitted into the mouthpiece of a CCR and the CO2 is monitored by electronics housed in a box about half the depth of a matchbox, mounted on the exterior of a Rebreather Bail Out Valve. Currently this system looks to be a distinct reality within half a decade with one industry expert of note enthusiastically commenting that this was how he felt 30 years ago when he was pushing the frontiers of biomedical electronics. In the exhibition halls several new products were on display for advanced divers to see, touch and play with including the World Debut of the new Kiss Gem diving system from Jetsam Technologies. The GEM system is a gas extender, marketed as one of the lightest, smallest and most inexpensive rebreathers on the market today. 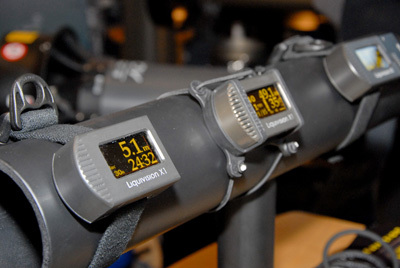 The unit is likely to be perfect for the recreational or travelling diver. 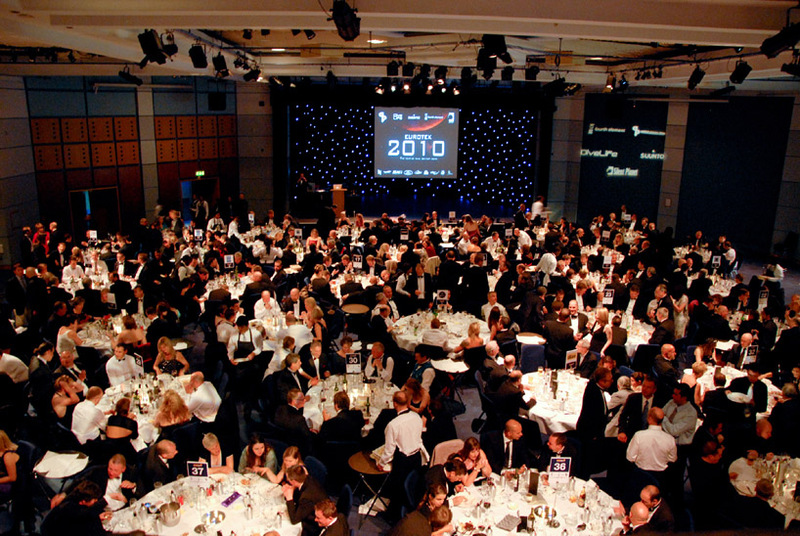 On Saturday night 430 delegates and luminaries from the diving industry sat down to a Gala Award Dinner and Raffle. During the evening over £2,000 was raised for Deptherapy, the disabled diving charity headed up by Fraser Bathgate. The star prize, a X-Scooter Deep Ideas Cuda Scooter being won by a Spanish Delegate who was thrilled because his next purchase was going to be a Scooter. 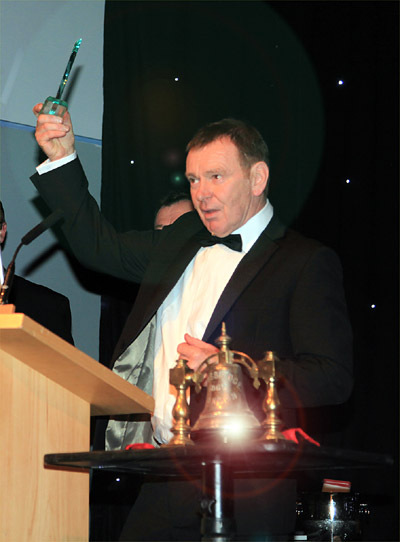 The dinner guests then celebrated success with Ric Waring who recently made DIVER news. Ric was voted EUROTEK.2010 Diver of the Conference because of his phenomenal diving season exploring and identifying British shipwrecks. Waring was also noted for his devotion to shipwreck exploration and his significant expedition to date has been to RMS Carpathia. She now lies in 155 metres in the challenging Atlantic Ocean. EUROTEK.08 saw Mark Powell launch his book Deco for Divers. 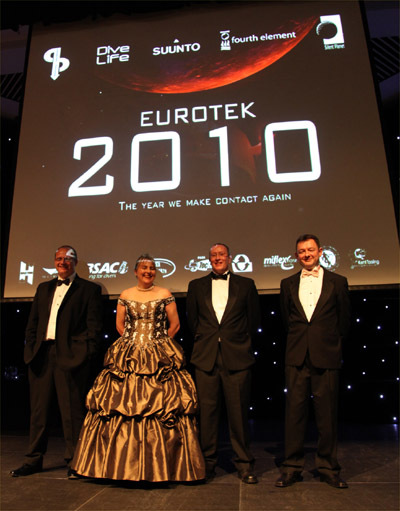 It was therefore fitting that Powell received the award for the EUROTEK.2010 Publication of significance. Deco for Divers is now on its second print run because it is considered by many divers to be an Advanced or Technical Diving Publication that has educated / inspired / influenced delegates diving. 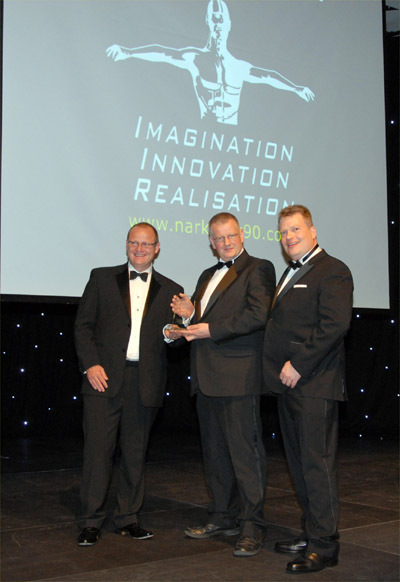 The noted EUROTEK.2010 Innovation Award was given to Narked @ 90 for their Cell Checker. This was considered by the delegates as an Advanced or Technical Diving Innovation that has enabled divers to further their diving and /or making their diving safer. The Cell Checker will contribute to diver safety because it helps the individual to check their true milli volt readings of Oxygen sensors in the rebreathers. 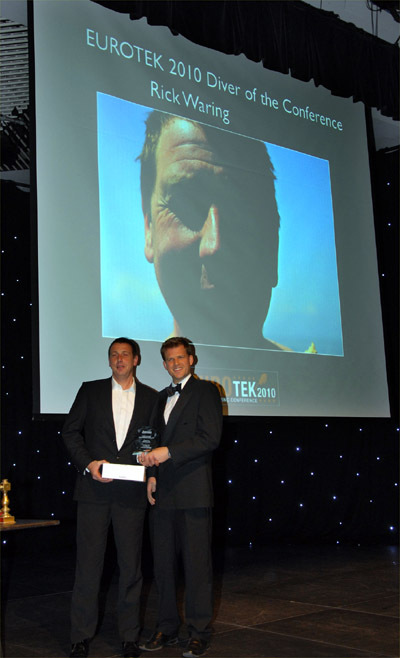 Industry stalwart John Womack of Divers Warehouse / Otter Dry suits received a special EUROTEK.2010 Award for Outstanding Contribution to the Diving Industry with over 40 years of service to divers and industry individuals, through sponsorship of advanced diving expeditions such as HMHS Britannic.